Brickwork is masonry produced by a bricklayer, using bricks and mortar. Typically, rows of bricks, called courses, are laid on top of one another to build up a structure such as a brick wall. Parts of brickwork include bricks, beds and perpends. The bed is the mortar upon which a brick is laid. A perpend is a vertical joint between any two bricks and is usually, but not always, filled with mortar. Stretcher: A brick laid with its long narrow side exposed. Header: A brick laid flat with its width at the face of the wall, or parallel to the face of the wall. Soldier: A brick laid vertically with the long narrow side of the brick exposed. 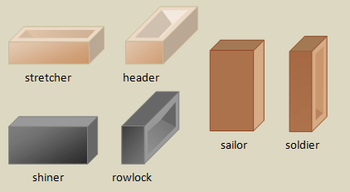 Sailor: A brick laid vertically with the broad face of the brick exposed. Generally the whole process of brickwork goes unattended as we don’t give much importance to it, but ignorance towards quality and workmanship may destroy your dreams. So here we have summarized few observations which should be given care during brickwork. Bricks should be immersed in water for at least 24 hrs prior to use otherwise it will absorb the water of cement mortar. Bricks to be used should be as per specification and dimension. 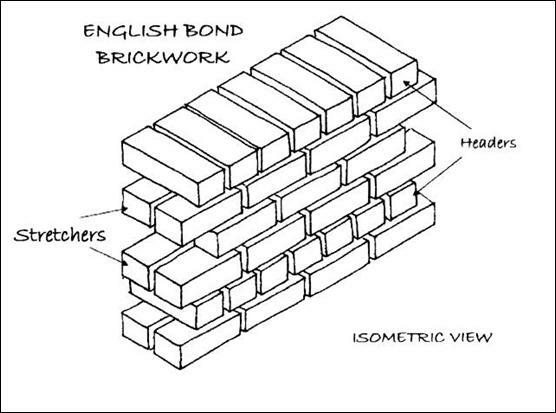 Unless otherwise specified, brick work shall be done in English Bond. Perpends should not vertically align in any two successive courses. No bats or cut bricks shall be used in the work unless absolutely necessary around irregular openings or for adjusting the dimensions of different course and for closers, in which case, full bricks shall be laid at corners, the bats being placed on the middle of the courses. The bricks shall be laid in mortar to line, level and shapes shown on the plan, slightly pressed and thoroughly bedded in mortar and all joints shall be properly flushed and packed with mortar so that they will be completely filled with mortar and no hollows left anywhere. Bricks shall be handled carefully so as not to damage their edges. Bricks should not also be thrown from any height to the ground but should be put down gently. All courses shall be laid truly horizontal and all vertical joints made truly vertical. The verticality of the walls and horizontality of the courses shall be checked very often with plumb bob and spirit level respectively. Vertical joints on one course and the next below should not come over one another and shall not normally be nearer than quarter of a brick length. Fixtures, plugs, frames etc. if any, shall be built in at place shown in the plans while laying the courses only and not later by removal of bricks already laid. The top layer of bricks of one or more thick wall coming in contact with R.C.C beam, slab and at window sill level etc shall be laid on edge as per direction of Engineer. Care shall be taken during construction to see that edges of bricks at quoins, sills, heads etc. are not damaged. All external walls should have fair face on exterior surface. Joints shall not exceed 10 mm (about 3/8″) in thickness and this thickness shall be uniform throughout. Where pointing is to be done, the joints shall be raked out not less than 10 mm (about 3/8″) deep when the mortar is green. When the brick surface are to be plastered, the joints shall be raked to a depth of 5 mm when the mortar is green, so as to provide good key to plaster. Brick work shall be carried up regularly in all cases where the nature of work will admit, not leaving any part 60 mm lower than another. But where building at different levels is necessary, the bricks shall be stepped so as to give later at uniform level and effective bond. The rate of laying masonry may be upto a height of 80 cm (about 32″) per day if cement mortar is used, and 45 cm (about 18″) if lime mortar is used.